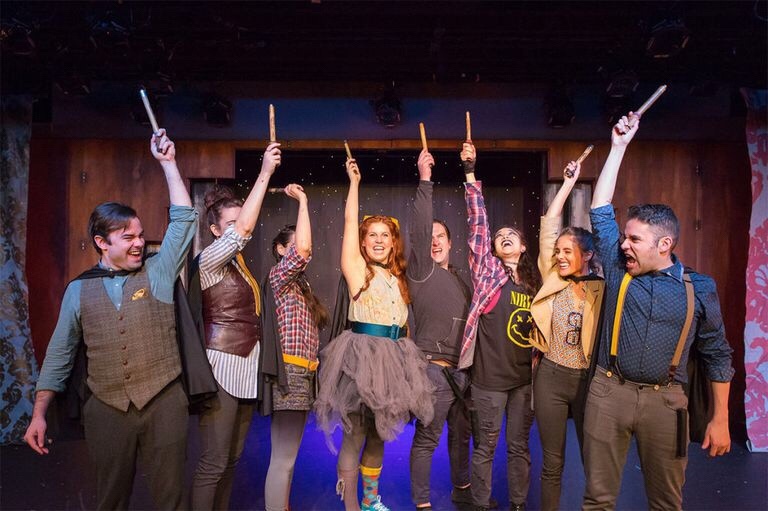 A few episodes ago on Gabbing Geek, which I think was recorded in 1994, Ryan reviewed an off-Broadway play called Puffs, which parodies the Harry Potter series, telling it through the point of view of the series’ lovable loser house. Fathom Events recorded the play and screened it in the theaters as a special, limited engagement. Given that I am dating one of the biggest Potterheads in the world, it didn’t take a divination spell to tell you I would be going. You know the story. It was presented in seven books, eight movies, tons of merchandise, a spin-off film series, and one of the best selling plays ever produced. But what you didn’t know is that the Hufflepuffs, the kind hearted house closest to the kitchen, were special too. So we get to follow their adventure for “ninety-ish minutes” as we follow things parallel to the famed adventure of young Potter and Griffindor. The concept was hilarious I love parodies that don’t stray too far from the source material, and Puffs gets as close to the source material as you can and not find yourself sued for IP infringement. They use names, exact phrases, and settings. It’s pretty solid. The cast really sold Hufflepuff I really enjoyed the cast. The Hufflepuff counterparts of the Big Three were quite good, as was the guy who played Cedric Diggery (aka the only Puff that mattered). He was very reminiscent of a young Tim Curry (Clue). My girlfriend loves Harry Potter She was in absolute heaven. Her happy…makes me happy! It was a lot of fun. It was farcical but did end with some heart. The Puffs has a strong message of being yourself and just finding the group of people who accept you for who you are. We could probably all use a dose of that every now and then. Overall, I give THE PUFFS8 “Third Places“ out of 10.